It's hot like hell in Acqua Traverse. Even in the stifling atmosphere of this lost village in northern Italy, where people yearn for a better life, Michele Amitrano finds time to ride his bike and explore the fields of wheat with his friends Salvatore, Antonio, Remo and Barbara. And his sister, Maria, too. When Michele accepts a dare to get into an abandoned house, he discovers a secret passage too amazing to share with anyone else. The problem is that such discovery will eventually and inevitably make him see the fine line that separates adults from children―the threshold of monstrosity. "I'm not scared" is a short, but poignant story. It strikes the reader right in the heart, making it impossible to put the book down. Its two hundred and few brilliantly-written pages contain the essential elements that make reading something close to an obsession. Through the eyes of a nine-year-old boy, we see the value of true friendship and the pain of disappointment. How not to be moved by someone else's sacrifice? How to face the fact that sometimes those you trust most are the first ones to disappoint you? The real purpose of those around us is never what it seems to be. Behind every smile, there is always a hidden intention. And this kind of discovery can be very painful. Such reality, stripped of euphemisms, is perceived by Michele as the story progresses. It ends up yanking the little boy from the naïve universe that surrounds him, making us complicit in his anguish, in his effort and hope that everything will end up well. The greatest merit of author Niccolo Ammaniti is to raise disturbing questions about the ethics of a typical child, making us understand the roots of our own morality. It is impossible not to ask yourself, "What would I do in Michele’s position?" And what about the end of the book? Maybe it’s one of the best yet written. 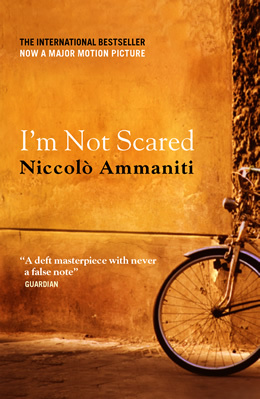 It’s no spoiler to say that Ammaniti is a master at creating suspenseful situations that become increasingly urgent. That's exactly what happens at the end of "I'm not scared." As pages go by, readers feel like their breath is taken away, pulled by the letters and lines that jump out of the paper. And it all ends up suddenly, but in a perfect way. By the way, the book became a movie by the same name. Don't waste time on it. It's one of those cases in which the movie is inferior when compared to the book. In this case, it's actually unfair to make such comparison. Editor's Note: The reviewer read the Italian-to-Portuguese translation by Roberta Barni. Jonathan Hunt was responsible for the Italian-to-English translation. GUSTAVO ARAUJO was born in Curitiba, State of Paraná, in 1973. He started to experiment with short stories when social networking websites became popular around 2005 and, four years later, he published his first novel, O artilheiro ["The Goal Scorer"], which was shortlisted for the National Contest promoted by SESC (Social Service of Commerce). His work has the YA universe as a backdrop, exploring the difficult transition from innocence to the real world, platonic love, conflicts with parents, and how loyalty among friends is put to the test. Today he is also the coordinator of Entre Contos, a website dedicated to literary challenges to boost the creativity of Brazilian authors. Posted in Collective Reading and tagged with , , , , , . July 28, 2014 by Rafa Lombardino.